Cloud Dancer is a luxury log home with one of the best scenery in the state. A full wall of windows in the double-height living room looks out over the lush green peaks of the Smokies, with not a tree growing up around it to block the view. This mountainscape is framed by a high-end living room with soaring rafters, warm wood finishes and leather armchairs gathered around a gas fireplace and a wall-mounted flat-screen. On the main level behind the living room, a fully equipped, modern kitchen basks in the natural light borrowed from the picture windows. The main floor also includes a long, family-style dining room table with seating for eight guests. The wraparound breakfast counter in the kitchen can seat six more on tall, wooden stools. A finished lower level is home to a large recreation area with a pool table, a 60-game arcade console, a vintage pinball machine and juke box, and a collection of records. Perhaps most extravagant luxury at Cloud Dancer is the private theater, with a nine-foot screen, an advanced speaker system and eight reclining chairs. Sleeping arrangements: The master bedroom holds a king-sized bed, and is beautiful and inviting with a vaulted ceiling, private mountain view and a flat-screen TV. The connected bathroom includes a tile shower, triple vanity and glass block windows, as wells full-sized laundry facilities. Two more bedrooms are located on an upper level loft, each furnished with a king-sized bed, a flat-screen TV, and a breathtaking view. The upper-level bedrooms open onto a balcony on the mountains-facing side of the house. In addition to its many indoor delights, Cloud Dancer furnishes the exterior of its property with a number of wonderful spaces, such as the wraparound lower veranda with a hot-tub and a meticulously landscaped outdoor patio with yard swings and a grilling area. Nearby, the cabin enjoys access to a privately-owned half basketball court and three community swimming pools. Nestled between the hills and trees in the Village of Cobbly Nob, Cloud Dancer is both quiet and scenic. 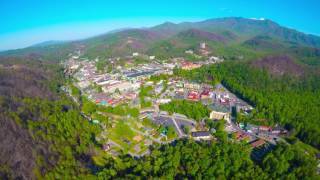 However, should you seek a busier vacation schedule, it is located just 12 miles from the city of Gatlinburg, TN, where there is plenty to do and see — from shopping and restaurants to museums and live shows. One of the closest popular attractions is the Climb Works Zip-Line tour, which offers a bird’s-eye view of the mountainous terrain. Other can’t-miss entertainments include the Ripley’s Believe It or Not! 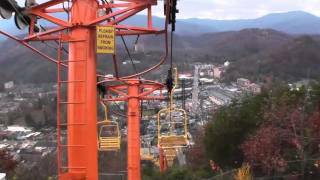 Odditorium and Aquarium, or the network of outdoor adventures that is Ober Gatlinburg — with a scenic Sky Lift ride, ice skating, downhill skiing, a wildlife encounter, and Aerial Tramway and the Ski Mountain Coaster. Back in Cobbly Nob, guests can enjoy the scenic Bent Creek Golf Club, designed by PGA great Gary Player. The course is beautiful, challenging and has very reasonable rates. Base rates at Cloud Dancer range from $171.00 to $610.00 per night, with a two-night minimum stay. Final pricing includes a damage waiver, a reservation fee, and local and state taxes. Please inquire with the property manager for an exact quote. **This property is excluded from promotional discounts.